Rancho Bernardo dental patients are enjoying straighter teeth and a healthier bite thanks to Invisalign® Provider, Dr. Mary Afzali. Invisalign is an innovative alternative to traditional metal braces, using custom-crafted, form-fitting dental trays. They offer a completely clear-colored and removable solution to a more beautiful smile and a more confident you. At our dental practice we are proud to have Dr. Afzali, who has been recognized as the premier Invisalign provider in Rancho Bernardo and continues to correct smiles for patients who choose this alternative clear aligner procedure. Invisalign® is a viable alternative to traditional braces. 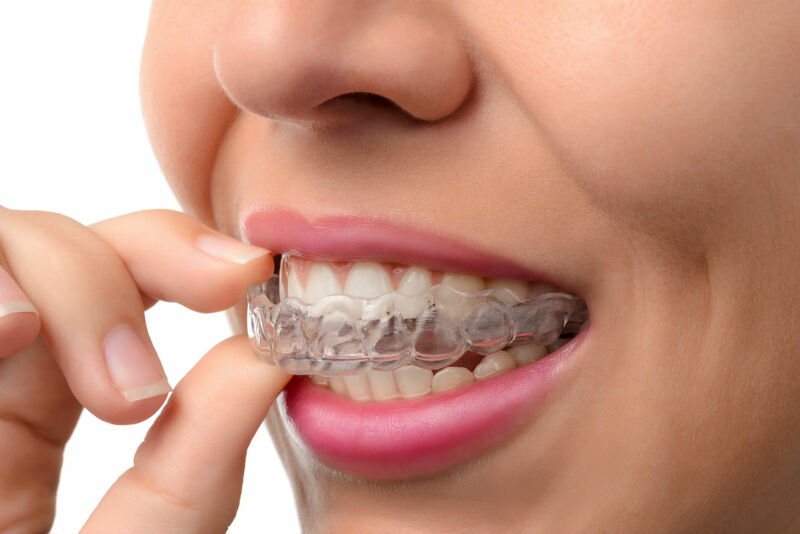 Clear aligning trays are used to straighten the teeth; this method is not only more comfortable for the wearer than traditional braces but also far more discreet. Invisalign® trays are removable for more convenient oral health care and while eating. For best results, the aligners need to be in place for 22 hours each day. Every two weeks on average, you change to a new aligning tray. The result? Straight teeth in less time than you ever imagined possible! If you’ve always wanted straighter teeth but hated the idea of braces, Invisalign® might be the perfect choice for you. Dr. Mary F. Afzali and her staff have ample experience helping patients achieve the brilliant smiles they’ve always wanted; Dr. Afzali is highly involved in the process of straightening teeth with Invisalign®. Although some patients will need impressions taken, the vast majority of imaging is done with a digital scanner. All patients are first put through a qualification process to ensure Invisalign® is the best option. RB Family and Cosmetic Dentistry in San Diego not only handles Invisalign® but a variety of other dental procedures as well. Dr. Afzali and her team offer preventative dentistry, cosmetic dentistry, laser dentistry, and more. Whether you are due for a cleaning or want to restore your smile to its once brilliant glory, RB Family and Cosmetic Dentistry is here to help! Schedule your appointment by calling 858-769-5349. Contact us today! If you want to know what I think of Dr. Afzali and her staff all you really need to know is that I live in Portland and I fly to San Diego to see Dr. Afzali for all my dental work. That might seem a bit extreme, and perhaps it is, but hear me out before you decide. A couple of years ago when I was living in the Bay Area I had to have one of my front teeth removed and dental implant inserted in its place by a dentist in the Bay Area. The implant looked a little shorter and darker than my other teeth, and even made my gum above it look a bit darker than the adjacent gum. In short, it didn't look natural. So I wasn't completely satisfied with how my smile looked, but I thought that was the best that could be done. It wasn't. Last summer while I was in San Diego visiting my parents I went to Dr. Afzali for a routine cleaning. She examined my mouth and immediately asked me whether I was happy with the way my implant looked. When I said I wasn't, she explained that she could make it look better and possibly even indistinguishable from my other teeth. She was right. My implant looks just like my other teeth, and my gum is pink again. In fact, my new implant looks so natural that I sometimes forget it's an implant. I couldn't be happier. One final point. Dr. Afazli's entire staff is great. When I walk in they all make me feel like I'm the most important patient they have. And Julie is particularly great. Because I live in Portland my visits to Dr. Afzali's office had to me perfectly timed with receipt of the various parts necessary for my procedures. Julie made sure that everything arrived when necessary, without fail, so that no flights or appointments had to be rescheduled. Recently, while on a trip from Canada to visit friends in San Diego, I broke a tooth. I phoned RB Dentistry and was given an appointment without delay. Dr. Mary Afzali was reassuring and professional and did an excellent job fixing the broken tooth. Her dental assistant, Marinette, was kind and gentle and made me feel comfortable throughout the procedure. Julie at Reception was welcoming, warm and made me laugh with her wonderful sense of humour and handled the insurance processing with no complications. Thank you so much Dr. Afzali, Mari and Julie for one of the most pleasant dental appointments I've had in a long time! Hope to see you in Vancouver, B.C. sometime! I know I am in good hands with Dr. Afzali at RB Family Dentistry. The cavity fillings and tooth root fillings I got there were done so well that when I went to the Southwest College Dental Hygenist school to help out a friend, they could barely even detect the fillings! The teachers there were very impressed. At RB Family Dentistry, the staff and hygenists are friendly, organized and very knowledgable, and the Dr. always gives me as much time as I need and answers all of my questions. The office is beautiful and state-of-the-art. They never try to sell me on additional products or services that I don't need.